Shutterfly has soft cover and hard cover books in many sizes. Soft cover books are less expensive. When you want a personal photo book with professional presentation and impact, spend the extra money and get a hard cover book. The covers are gorgeous, and the interior pages look and feel like a real book. Printing quality is excellent, and images are just as bright and colorful on Shutterfly’s book pages as they appear on your Mac’s display. I will never again order an iPhoto book from Apple, given the choice. The Internet is full of raves and rants for a dozen or more competing online book printing companies. Until I am proven wrong, Shutterfly is my first choice. Because I was preparing to teach a cross-platform seminar on Shutterfly, I created a Desktop folder for uploading my photos, instead of using Shutterfly’s new iPhoto Uploader. The latter is preferable, as is a similar Windows Uploader for our friends on the Dark Side. 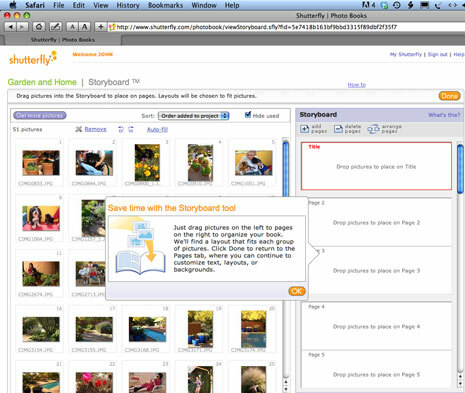 Shutterfly’s interface is not immediately easy to navigate and use because Shutterfly is an extensive operation. It will take you a while to become familiar with the Shutterfly web site, and the effort is worthwhile. If you are in a hurry or don’t want to make countless decisions for every page of your photo book, use the Simple Path. It has enough flexibility to help you create a stunning, personal book. MyMac’s advice is to produce two or three Simple Path books before you make your first Custom Path book, but many of you will ignore this advice. As with Apple’s iPhoto books, individual copies and shipping can be a bit pricey. Shutterfly sweetens the deal with instant discounts on multiples of a book being ordered, plus frequent promotions and discounts that arrive via email. My family is delighted with the free promotional order of holiday cards that I received a few days after ordering them. I had to pay shipping. 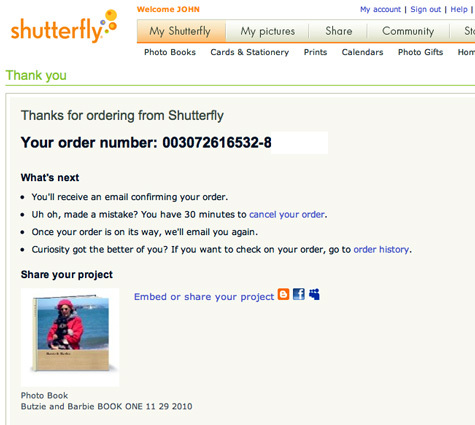 Shutterfly has a 100 percent guarantee, with phone and email customer support. I had no reason to contact them. I made my first semi-custom Simple Path 8×8 inch hard cover photo book in a couple of hours last week, and my masterpiece arrived a few days later. Enviro-friendly packaging is used. My family members, friends, and seminar participants were all very impressed. The following week I made a fully custom 8×8 photo book with captions, from images chosen by my wife. The creative workflow process took a long time, because it was a two-person project. I was using really old black and white pictures, postcards, etc. The pictures were extremely small, and some 2” x 2” had been cut into circles. Poor quality but important pics. I had scanned and enlarged in Photoshop Elements but couldn’t do much editing to improve them. Mom had written on them years ago, which helped me decipher who was who but caused great difficulty when I was trying to crop to the Shutterfly templates. I had also used Photoshop to print on the photos. I will NOT do that again. Not the best way to do my first Shutterfly book. Definitely not digital. I also used the Help WRITE A QUESTION, and I received an email answer next day. At one point I had spent so many hours on Shutterfly that a message appeared asking if I needed help! To me, the process of making the book was very enjoyable after I began learning how to use the crop tools and text tools and learned I could use the same picture twice. I am eager to see what actually happens in the finished project and glad I will have a book for myself to learn what works and what doesn’t. I didn’t want to get hung up changing backgrounds so kept it the same throughout. I chose Simply Pink because it was for Mom and about her female ancestors. I chose Custom Path because of the text layout options. I chose a larger book because I thought the poor pictures would need as much help as I could provide. I loved working on the Storyboard section of photo book planning. It was easy to decipher, click and drop back and forth to different pictures when I changed my mind. I was able to use the same picture more than once by using the Add Pictures. I had numbered my pictures with a # before each. Shutterfly threw them all in randomly and I never figured out how to get them in order with that method. I went back to my folder and relabeled them alphabetically, which worked like a charm. THE BIGGEST HINT IS TO ALPHABETIZE YOUR PICTURE NAMES BEFORE YOU UPLOAD TO SHUTTERFLY, IF YOU WANT TO KEEP THEM IN CERTAIN ORDER. I needed more space for a picture (template too small) so I used two spaces. We’ll see if that worked. My Hardcover Photo book had 28 pages. Cost is $34.99 for 20 pages, plus a special of $1 each additional page totaling $8 = $42.99. The second identical book is $17.50 + 8 pages at 50 cents each, added $4. Shipping is $9 each, which would have qualified for free shipping if I had sent to same address, so my total order is $86.69. I feel the price is very reasonable and know I will do more books. I plan to do a graduation book for a granddaughter. At least I will start with better quality pictures and all the things I learned doing the first one. I made my first Shutterfly book. I liked the color of the photos and doing it was fun but more time consuming than iPhoto. When it was delivered and I looked it over, I had five glaring mistakes. Mostly dropped words and letters. I have pretty bad eyesight and the print, for me, is not easy to see. I was very disappointed about this. I will just check and re-check. There is a good checker built in and I was warned there was trouble but I couldn’t find the trouble with the tiny print and have to live with my errors. Just a warning here. I don’t think the books are as rich in appearance as iPhoto books but I do like that the colors are true and the price is right. I bought two books (with all the mistakes) for less than the price of one on iPhoto. So thank you for this option. I will use it for some projects but perhaps not all. This overview article is the first but not the last one at MyMac about Shutterfly. As we use it more we will have additional articles and podcasts. We welcome your comments, positive and negative. Apple has a 10 billionth app sold contest and I’m going to WIN! I’ve used shutterfly and prefer iPhoto. iPhoto is much easier and smoother than any online book maker and I have always gotten fabulous results. Gotta’ go with Donny on this one, John. I’ve ordered books via iPhoto twice and both times the quality was superb and without a single flaw. It was quick and easy to add photos from my iPhoto library. Everything about it, including the packaging from Apple, showed a tremendous amount of attention to detail and craftsmanship. Granted, I’ve never used Shutterfly to make a fair comparison, but perhaps for my next project I will. Interesting option, though. I’ve always gone for the Apple ones because I have iPhoto and Aperture, both of which support the Apple branded books and products. However, I’ll definitely have to consider my other options for next time.